Were I pressed to name a brand that pairs well with Apple products, Razer would be one of the last names to pass my lips. Its designs—which tend to favor mutagen-green lines snaking though sturdy plates of black metal and plastic—look better suited to the Borg than to the drawing board of Jony Ive. It’s a favored brand of the kind of gamers who lurk in the PC Master Race subreddit and make acidic quips about Apple, and for that matter, it caters to folks in love with resource-demanding PC games that often never get ported to the Mac. And yet, for all that, the new Core X external graphics processing unit finds Apple and Razer as strangely accommodating bedfellows. In fact, after spending some time with it over the past few days, I feel comfortable in saying it’s even a better enclosure than the Sonnet Breakaway Boxes that Apple itself recommends. I realize this is a big claim, but it’s not without merit. 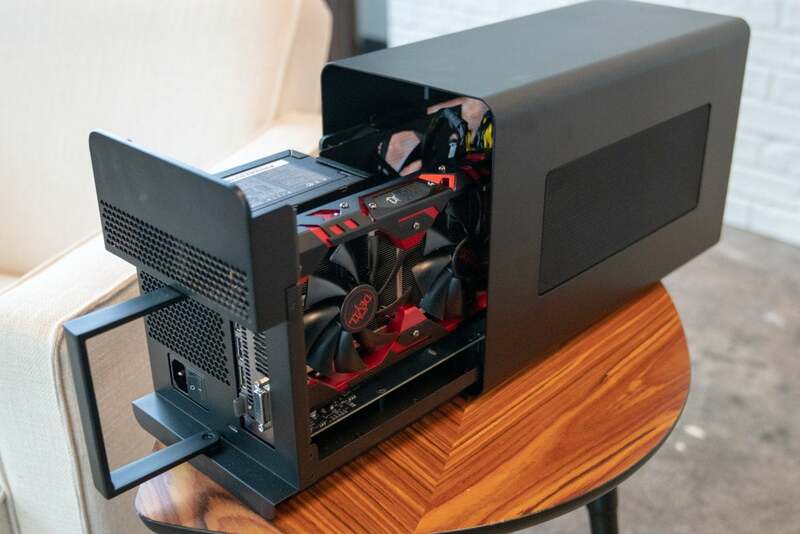 The Core X is an impressive product for a company that’s too often known for style over substance (and sorry, PC Master Racers, I’m not talking about Apple). It’s also a rare example of constraint from Razer. It sets out to do one thing—to temporarily make a laptop like a MacBook Pro into something with the graphical power of an iMac or better—and it does that job well. (I went over the pros and cons of eGPUs in extensive detail last month.) And more importantly, it does it inexpensively. Razer already has an enclosure called the Core V2 on the market (which now works with Macs as well), but at $499, it was a pricey thing. The Core X, by contrast, costs a measly $299. The graphics card we used had more ports than the Core X itself. Otherwise, the Core X is an exercise in simplicity than Apple should appreciate. Here, the only sign that it’s a Razer product is the tasteful silver logo embossed on the side grill, free of any eyebrow-raising green coloring. At 13 inches long, 6.3 inches high, and 2.36 inches wide, it’s a squat and hefty thing compared to the Core V2, but I could probably drop a PC tower on this 13.4-pound beast (when empty!) and it’d come out fine. The noise on its fan got louder as I played more graphically- intensive games, but never anywhere so loud as the fans screaming from my MacBook Pro without it. The Core V2 is basic, but it means business. In fact, I find myself wondering why anyone would want to buy the V2 at this point. A couple of inches of desk space isn’t so essential that I could justify choosing it over this, especially as it pumps out 650 watts of power, supports massive three-slot PCIe cards, and even powers my MacBook at 100W. (The V2’s svelte form means it can only support a 500W power supply.) Even the high-end Sonnet eFX Breakaway Box's 650W falls short in this regard, as it only charges at 87W. Razer's own Core V2 could only deliver 65W. Nor is it a hassle to set up. Barely 15 minutes passed from the second when I cut open the box to the moment when the Core X was powering an external monitor through my MacBook Pro, as it started working immediately after I slipped in an AMD Radeon RX580 and plugged it in through my MacBook Pro’s Thunderbolt 3 port. And now that it’s out of the box? Switching cards takes a matter of seconds. The handle serves as both a grip and a lock. It’s hard to overstate how much I like this. Back when I first showed off eGPUs not long after Apple announced support for them in macOS 10.13.4, I found myself frustrated by how long it took to switch from one card to another, thanks in part to an overly fussy system of four screws for keeping the card and chassis in place with the Akitio Node Pro enclosure. The Core X removes several minutes from the process. Switching graphics cards is a simple matter of pulling back a handle hidden on the back, which in turn unlocks an interior mechanism that keeps the power supply and graphics card safe within the tanky chassis. After that, it’s just a matter of pulling out all those guts in one gesture, undoing a single screw that holds the card in place, switching out the card, and sliding the guts back in. It reminds me of nothing so much as the Ghostbusters slipping on of their traps back into the containment unit. I like that. Unintentionally or not, it’s a bit of “gamer cool” that fits well with the Razer brand. For all that, though, it’s still just an eGPU. I’m more than pleased with the ease of setup, but in practice it doesn’t differ significantly from the performance results I got while using the Akitio Node Pro last month. Performance varies depending on which card you have stuffed in its innards, of course, although the Core X’s 650W of power and three PCIe slots ensures that you’ll be able to use virtually any card you prefer. For that matter, that kind of power brands the Core X as a forward-thinking device, as it should be able to handle whatever cards the market tosses our way over the next few years. 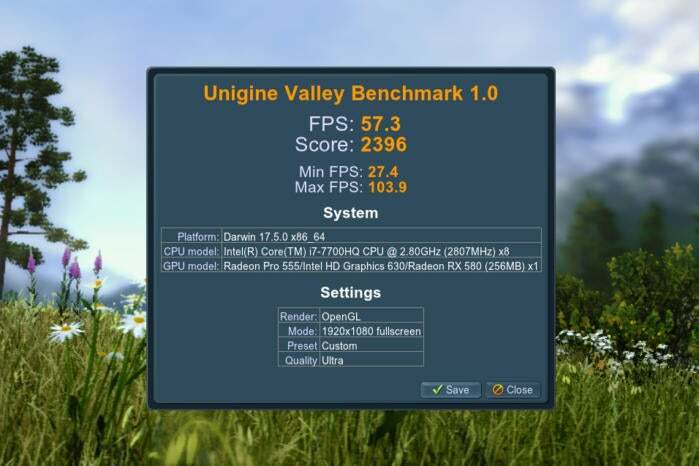 In the case of my own 2017 15-inch MacBook Pro with Touch Bar, that means I was able to push the framerates in Unengine’s Benchmark Valley on Ultra up to almost 60 frames per second while the onboard card struggled to reach 30. Not too shabby (for the card), especially with Open GL. Keep in mind, though, that an eGPU can't fully make up for RAM deficiencies. The Core X doesn’t do everything I want it to do, but the fault for that mainly rests on Apple’s shoulders. 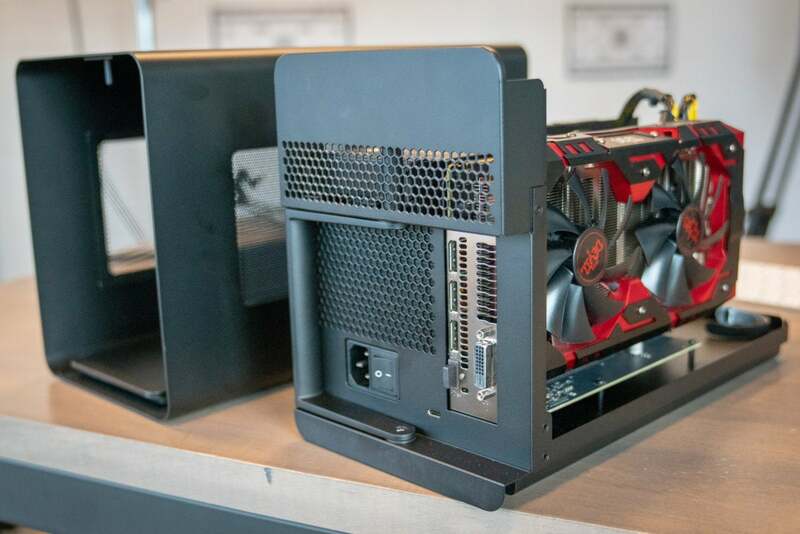 Apple’s eGPU support on Mac is remarkable in that you don’t have to restart your desktop machine in order for an eGPU to work as you so often have to do on Windows, but the caveats pile up from there. Support for Nvidia cards is essentially out of the question (barring some advanced technical tinkering) as only AMD cards work natively with macOS, and Apple doesn’t even support eGPUs in Windows through Boot Camp. That’s especially a bummer fans of PC games who were hoping eGPUs would allow us to do away with having a separate machine for games altogether. Even Razer's list of officially supported cards for Mac is awfully small, ranging from the capable AMD Radeon RX 570 and 580 and the powerful Radeon RX Vega 56 and 64, to the wildly expensive Vega Frontier Edition Air, Radeon Pro WX 7100, or the Radeon Pro WX 9100. 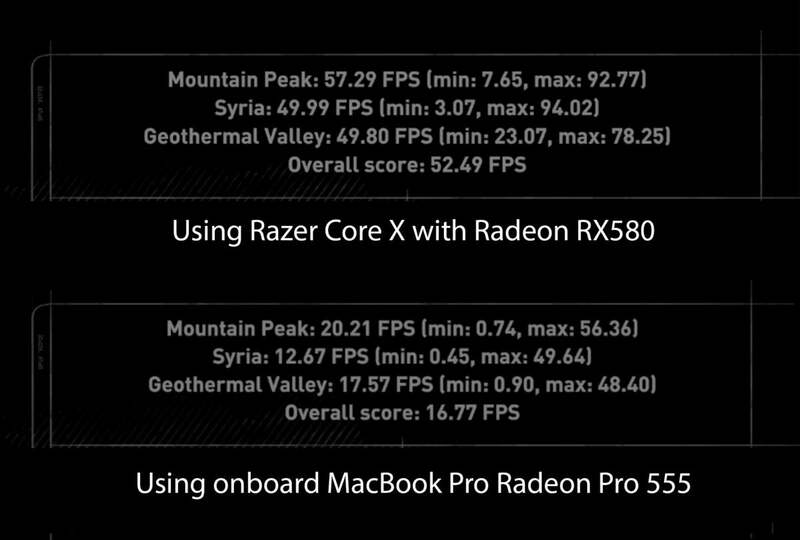 Results from the in-game benchmark for Rise of the Tomb Raider on Very High settings. And most importantly, you’ll need to have a Mac that supports a Thunderbolt 3 connection (running macOS 10.13.4 or later), which is a necessity owing to the massive 40Gbps that the Core X pumps through to your laptop. (Thunderbolt 2 could only support 20Gbps.) That rules out MacBook Pros dating from before 2016 and iMacs dating from before mid-2017, which significantly limits your options for the time being. 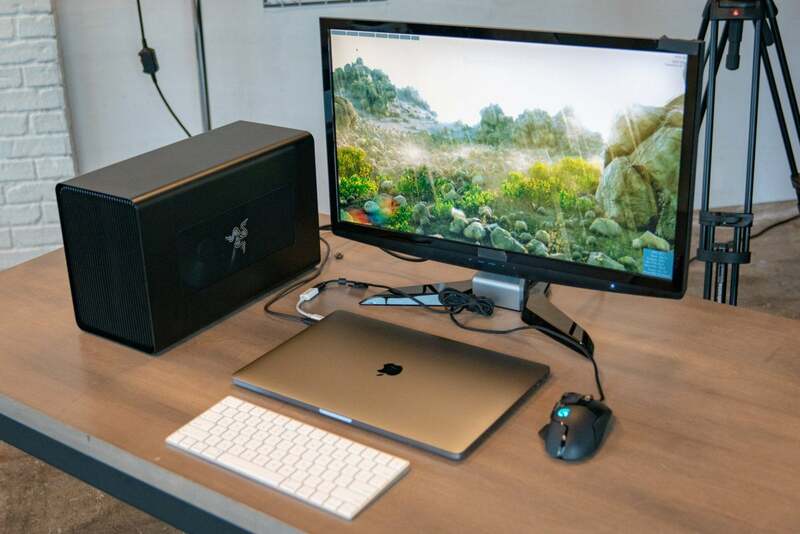 For that matter, eGPUs only work on Macs through external monitors, which means you’ll have to deal with extra clutter on your desk beyond the enclosure itself. And as far as I can tell, Final Cut Pro X still doesn’t take eGPUs into account when rendering videos, which feels bizarre considering Apple’s traditional focus on creatives over gamers. Once you get everything hooked up, you'll be looking at a cramped desk (and potentially a high price tag). Again, though, these are the usual limitations we expect from eGPUs on Mac (and keep in mind that I’m saying this only a few weeks after Apple officially rolled out support), to say nothing of how expensive all this can get once you buy a graphics card. For all that, the Core X’s simplicity makes it especially good match with the Mac considering the simplicity of Apple’s own eGPU support. Unlike PCs, there’s usually no need to install drivers for any of the supported cards, which means that getting the Core X to work with your Mac really is a matter of plug ’n’ play. So if you’re interested in gaming but prefer the portability of a MacBook Pro over the steadfastness of an iMac, this is a good (if arguably extravagant) option. And as the current MacBook Pros get older, it’ll be a good way to get more life out of them. For now, it's the enclosure I'll be keeping on my desk.